A series of briefs from around the Ann Arbor Public Schools. The Washtenaw Elementary Science Olympiad – also known as the WESO Wizards – will be at Pioneer High School this year on Saturday, June 11. Doors open at 8 a.m. with second- and third-graders participating in the morning and fourth- and fifth-graders in the afternoon. Throughout the day, there will be open events in the cafeteria annex with hands-on activities and Leslie Science and Nature Center raptors for participants, spectators and family members. Other events will take place in the small gym and the soccer field; food and beverages will be on sale in the cafeteria. Students prepare and train for this day throughout the school year. Events have been designed to recognize the wide variety of student skills. While some events require knowledge of scientific facts and concepts, others rely on scientific processes, skills, or applications. This ensures that everyone can participate. For an article about the WESO program, visit here. Details on the Web: http://www.aaps.k12.mi.us/wesowizards.home/home. An end-of-year variety show featuring high school exchange students from the Ann Arbor area is planned for Friday evening. This Youth for Understanding Showcase will take place from 7:30-9:30 p.m. June 10 at the Tappan Middle School auditorium. Tappan is at 2251 E. Stadium Blvd., Ann Arbor. A Youth for Understanding Showcase is featured Friday night at Tappan Middle School. The show will include singing, dance, music, skits, a fashion show and other acts – put on by YFU exchange students, their host families and friends. The event is free (donations will be accepted to the YFU program) and the public is welcome. A reception will follow in the cafeteria. Awards and door prizes will be given as part of the event. The YFU exchange program offers young people the opportunity to explore another country and culture, to master a new language, and to create lifelong friendships. YFU’s philosophy is to help young people acquire a passion for life-long learning and the skills and knowledge to thrive and contribute to cultural diversity. As of this year, 250,000 students and their host families have benefited from YFU exchanges worldwide. For more details about the YFU Showcase, going on an exchange to another country, or hosting an exchange student from Germany, Japan, Norway, China, Thailand, Liberia, Argentina or other country, contact Vickie Gaynor via e-mail at vgaynor@yfu.org, call her at 734-929-5554. 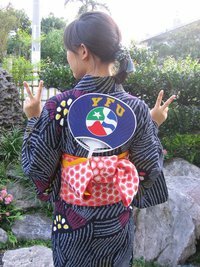 More details about YFU can be found on the Web.